Visible Flowing Current LED Cable – When you plug in your phone, you take it as a matter of faith that electricity is actually moving from the power source to your portable device. Oh, sure – the little battery icon shows that little lightning bolt, but it’s hard to see from across the room that charging is taking place. How do you know when it’s done? Pick it up, unlock it, check the number. Tedious and visually dull. When we spotted these Visible Flowing Current Cable we did a little dance. 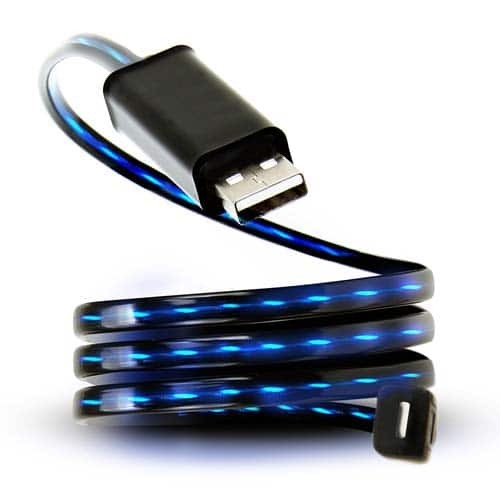 Embedded in this charging cable is a filament of Electroluminscent cabling that glows and runs as the charge moves down the cable, giving you instant visual feedback that power is flowing. The light show slows as your device’s battery approaches capacity, and then shuts off entirely when it hits 100%. That means you can tell from across the room whether or not your device is charged. The fun light show will remind us to charge, and the ending of it will help us get into the good habit of unplugging devices when they’re full. No more light show? No more juice. Finally! An iPhone cable that looks cool! Everyone has the same plain white iPhone cords. 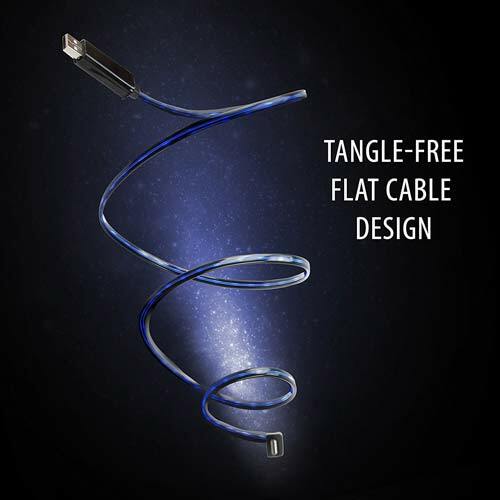 Dare to be different with this black cord that lights up blue! This cord not only looks cool, but charges quickly! The visible flow is an amazing feature that shows you how your charge is coming along. If you’re looking for a cooler iPhone cable and want to trust a product, this is the way you should go! The light is hard to see in the daytime, but it looks wonderful at night. This is a good thing, as I wouldn’t want it to be too bright and distracting while I’m driving. I am glad I made this purchase. I started my search for a Lightning cable that lights up after seeing a micro-USB version at a friend’s house. I spent a lot of time going through the options on various websites before locking on this cable here on groot. I’m pleased to say it delivers on its promises. 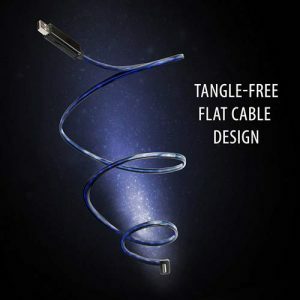 After connecting my device to it, the cable lit up with a sleek blue light that flows all along the black, glossy plastic cable. It looks pretty slick, especially in the dark. When my iPhone 8+ was nearing full charge (around 90% I believe) the visible flowing light slowed down noticeably, which is a great feature in terms of staying aware of the charging status. Exactly what I expected it to be. It’s awesome and really bright. I think it’s cool how the light speed changes depending on how charged your phone is; fast if the battery is really low & slow if your phone is almost done charging. Only downside is how short it is, a little bit shorter than the original white iPhone charger, but I totally love it! Recommended. Cool product, unfortunately the plug doesn’t fit when in the case. I use a Otterbox defender. Apart from that its perfect. This cable is great! Very well made. Feels strong like it will last awhile throughout my very active lifestyle. I am always busy and move around very quickly so I seem to be a bit rough on my stuff so anything built to last through that is perfect for me. The shipping was fast and the cord was packaged to protect it. The lighting on the cord is pretty cool. The light tells you where your battery is when you plug in by the speed of the light and when it is getting close to being fully charged. Definitely a FIVE 5TAR from me!! The feel of the cable is solid and sturdy, as described. The plugs are somewhat larger than average, which is the only real downside to this cable. However, it deserves to be noted that this also makes for a more solid feel especially when comparing to the original Apple Lightning cable and a majority of the other options that break apart after the slightest mishap. The running light looks awesome and changes speed as the charge goes up.